There’s a few people around here taking Casual Friday seriously! 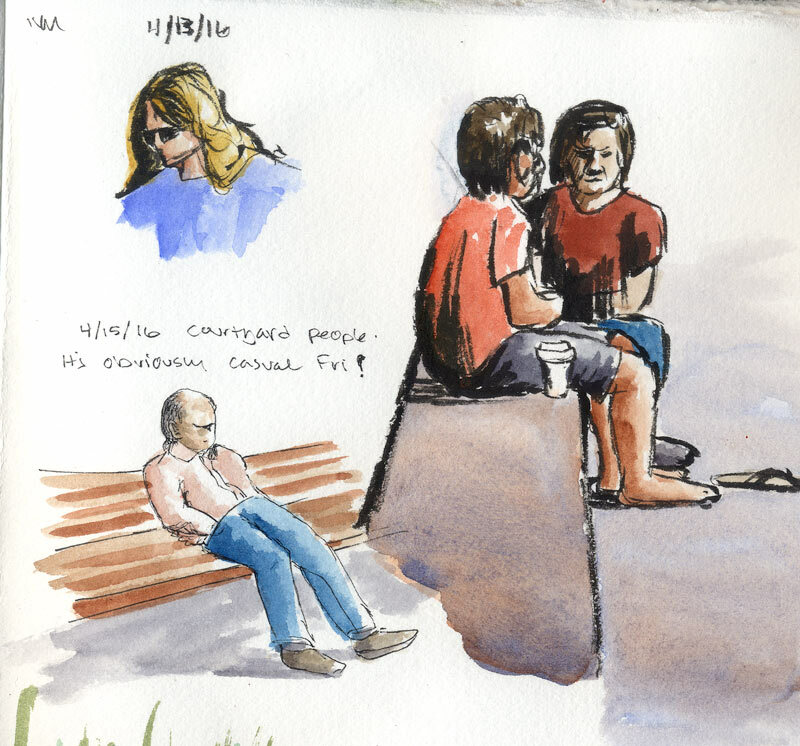 The two dudes on the concrete bench were not kids (one of them turned out like one) but they were barefoot and in shorts. Nice day for that sort of thing for sure. The guy slouching on the bench had the right idea. Elsewhere in the courtyard I found a pensive gent hanging out on the water feature. He also looks like a kid and really wasn’t – although he was sitting in the posture shown. Pitfalls of being new to drawing people: some days they just don’t turn out the way I intended. On Orange Shirt Guy I did something that’s rare for me: used some Bleedproof White to mask out a flagrant goof. I very rarely pencil sketch anything first and go right in with ink or paint, come what may. Half the fun of this is learning to roll with the changes, meaning that if I place something wrong, the rest of the painting has to flow in consequence to that, so it all still works. Once in a while (like maybe when I sketch a guy’s head 2x too big for his body?) there’s just not going to be any working around it. I can either let it go as a failed attempt – better luck next time! – or grit my teeth and fix it. This time everything else looked good except that ridiculous head, so I fixed it. He’s still proportioned like a child, but I can live-and-learn with that. Here’s a page of varying folks from a few days ago. 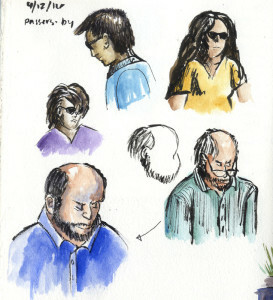 The man a the bottom is the same striped-shirted fellow I sketched on 3/22. His hair is actually the soft gray I rendered then. Today it ended up dark. He sat on the same block as before, but facing me this time. Bonus fun trying a face with a 3/4 view. I left his specs off in the second sketch to see if I could do a better job on his nose.